Andy Crouch, Strong and Weak: Embracing a Life of Love, Risk and True Flourishing (Downers Grove, IL: IVP Books, 2016). “Two questions haunt every human life and every human community,” writes Andy Crouch. “The first: What are we meant to be? The second: Why are we so far from what we’re meant to be?” (emphasis in original). 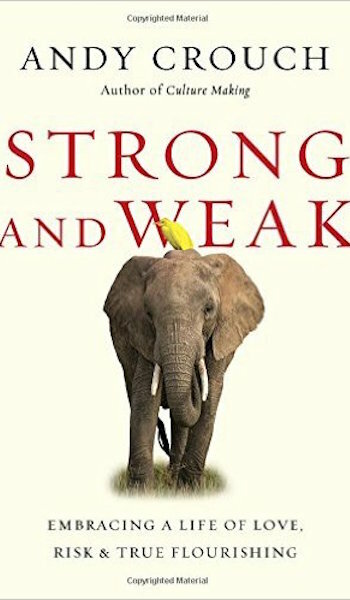 Strong and Weak offers an answer to that question which focuses on “the paradox of flourishing,” the necessity of pursuing “greater authority and greater vulnerability at the same time” (emphasis in original). Crouch defines authority as “the capacity for meaningful action” and vulnerability as “exposure to meaningful risk.” Most people—including many Christians—view authority and vulnerability in either/or terms. To the degree that we exercise authority, we insulate ourselves from meaningful risk. To the degree that we experience vulnerability, we lack capacity to take meaningful action. Given the choice between being a millionaire and a homeless person, who in their right mind would choose the latter? This choice is a false one, however. Without vulnerability, authority becomes exploitative. Indeed, Crouch argues that “the real root of the problem,” the answer to the question of why we are so far from what we’re meant to be, is “the quest for authority without vulnerability.” Without authority, on the other hand, the capacity for meaningful action, vulnerability reduces simply to suffering. The real choice we face is whether to withdraw from lives of meaningful action and risk or to embrace them both. Authority and vulnerability together lead to flourishing, “the life that really is life” (1 Timothy 6:19). “No human being ever embodied flourishing more than Jesus of Nazareth,” Crouch writes. “And precisely for this reason, no other life brings the paradox of flourishing so clear into focus.” Christ “humbled himself and became obedient to the point of death—even death on a cross. Therefore God also highly exalted him and gave him the name that is above every name” (Philippians 2:8–9, emphasis added). Whether in Christ’s life or in ours, flourishing = authority + vulnerability. Why did Christ live in such a way? For the sake of others, and this fact has a special application for Christian leaders. “Leadership begins the moment you are more concerned about others’ flourishing than you are about your own.” After all, even Christ refused to “consider [His] equality with God something to be used to his own advantage,” choosing instead to make himself “nothing,” taking on “the very nature of a servant” (Philippians 2:6–7). Crouch goes on to note that Christlike leadership carries two burdens: “If we want to be agents of transformation in the world, we must be willing to bear the burden of visible authority with hidden vulnerability.” A leader’s visible authority is what everyone sees, but hidden vulnerability means “to bear the risks that only you can see.” Christ’s visible authority was heard in His teaching and seen in His miracles. His hidden vulnerability, borne by himself alone throughout His public ministry, was His foreordained march to the Cross. Crouch notes the challenge of simultaneously exhibiting visible authority while bearing hidden vulnerability: “This will expose us to the temptation to become idols or tyrants ourselves—and yet without learning to bear hidden vulnerability, we will never truly be able to serve the flourishing of others.” Instead, we will use our manifest vulnerabilities to garner sympathy and manipulate allegiance. Strong and Weak is a small book—approximately 175 pages. But for me, it packed a large punch, almost with the force of a revelation. As a Christian and as a leader, I try so hard to insulate myself, my family, and those around me from risk, all the while enlarging the scope of my effective action and theirs. Far from contributing to my flourishing, however—or theirs—this effort makes it impossible to grow spiritually or to minister effectively. To do either, we must like Jesus descend from privilege into pain, for only by accepting meaningful risk can we also develop capacity for effective action. To borrow’s Paul’s phrase, when we are weak, then we are strong (2 Corinthians 12:10). And only then.